They just keep coming, don’t they? With the MWC expo a few days away, all kinds of rumors about future Samsung phones have been set. Most of them may seem the same, but this is not the case here. The Samsung Acme i8910 is sure to attract the attention of even the most pretentious users, since it offers a rich selection of high-end features, including the never before seen in a phone HD video recording. In addition to this, it’ll utilize an HDMI port, which combined with its DivX capabilities will make for a real portable multimedia player that can be easily attached to an HD TV. Judging by the leaked photos, the device seems to have a really slim and sleek design, reminding us of the ubiquitous OMNIA. But then again, a phone, similarly to a woman, isn’t all about the body. In relation to this, the Acme will be proud to offer also a built-in GPS receiver, Wi-Fi, a 3.5mm jack and DNLA support. 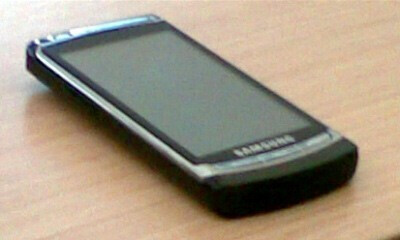 The phone is said to come in two versions – 8GB and 16GB one, both of which will most likely have a memory card slot. It seems to us that this would be an interesting device, in case Samsung is really going to meet the specifications mentioned above. One way or another, we’ll be looking forward to seeing it more officially, hopefully at the MWC. 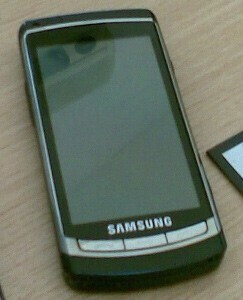 It's also rumored to be using the touch symbian interface similar to the one on the n97. They should outfit this bad boy with Android, or at least offer an option to do so. Wow..Like the article says: "They just keep coming"....HD video recording!!! that's gonna be crazy..what's next: Built in blue-ray player?......mmmmmm...maybe! Forget bluray, this has DivxHD with an hdmi port. Any chance this will come out for Alltel? Very, Very little. The model shown here is for a GSM network, which is only T-Mobile and ATT. Unless they make a CDMA version that's the only way, but unlikely. alltell? your are behind, in 3 months alltell will cease to exist. lest you forget VZW bought you. Quite likely never to see the light of day on US shores. What a shame. But i Live in South Dakota and here, Alltel is staying alltel. All the Alltel customers/towers/etc. in SD will be put into a trust and sold to another carrier. Right now it looks like ATT is vying for some of VZW's divestures, though given the issue of GSM vs CDMA frequencies and the fact that some rural carriers have issues with the #1 carrier selling assets to the #2 carrier, that might not happen. The other likely candidate is US Cellular, however we won't know for sure until it's all settled. Bottom line, in SD, Alltel will stop being Alltel probably by the end of the year. And if there's a CDMA version of this phone (good god I hope so), it'll be out on Verizon.